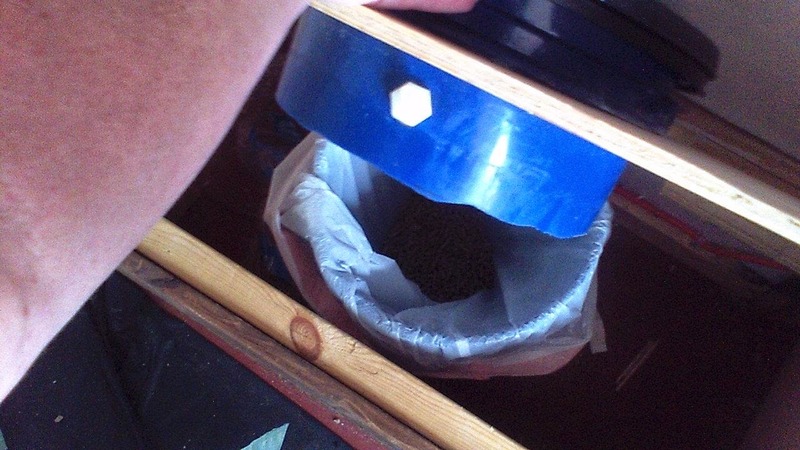 For those of you who have followed this blog for a while, you'll know that, all the way back nearly 5 years ago when we built the original Floating Empire, we opted for a simple bucket composter instead of a blackwater system for the boat. I had originally designed a urine diverter for the system, but . . .um . . .it didn't. . . .well. . .work. The bucket system, using compostable bag liners and largely wood stove pellets for compost mass, served us well for nearly four years. The original composting head going in Floating Empire. Note fitting for our original, failed diverter.....ah well. This winter, though, on moving to our new boat Tesla's Revenge, we began to get increasingly, not unhappy, but tired of dealing with the bucket composter. This isn't to say we don't like using composting toilets. We do. They're simple, inexpensive, and unlike every blackwater system I've ever seen, they don't smell and there's nothing to break. I can't imagine using anything else. 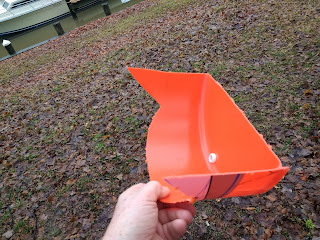 Unlike Floating Empire, though, the new boat was a traditional sailboat hull (a former CAL 29) and dumping the bucket meant taking it out of the head, climbing up into the cockpit with it, then up onto the dock, then. . . .you get the idea. This winter's weather has been unpleasant here. Unpredictable, wet, and windy, and that's meant spending a lot more time on the boat, which means we've been filling up the john far more quickly and having to empty it. . .well. . .a lot. But dealing with that led me to revisiting the idea of a urine separator. Here's the thing: MOST of the waste coming out of people is pee. Pee is what smells, and it's heavy (over 8 lbs per gallon) and takes up a lot of room. Separating the urine into a different, watertight container meant that we could empty the toilet far less often, which, since I'm the one that gets to drag five gallons of the stuff up and out of the boat, is something I kinda wanted to see happen. There are a lot of diverter toilet parts available on the market, and, like all good Americans, I went immediately to the web to look at them again. Immediately I encountered two issues: First, most of them made the toilet a lot longer front to back, designed as they were to accommodate a traditional toilet seat. 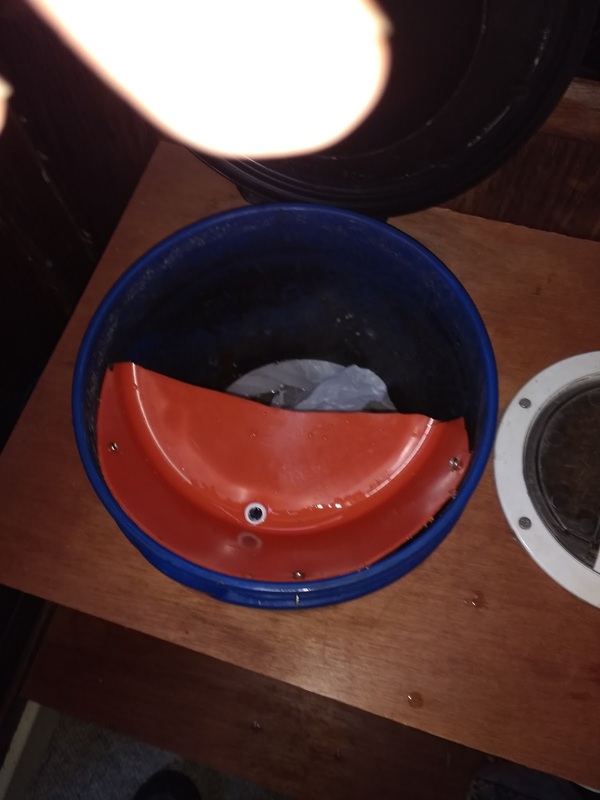 We use a snap-on toilet seat intended for use with 5 gallon buckets and really don't have that kind of room, and I wasn't anxious to totally rebuild our current toilet housing (for instructions on how to build the basic bucket composter, btw, click here). Second, the things were damned expensive, and, IMHO, weirdly so. 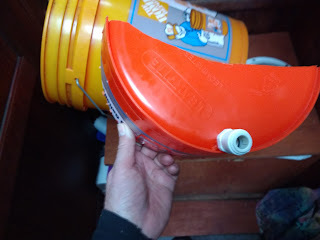 I did, however, stumble across a few sites that had some nice gonzo diverters made from the same 5 gallon buckets we were using for the toilet. Now if I could just figure out how to make them fit into our existing bucket composter housing. A container (Milk jug, cat litter jug, water bottle, soda bottle, whatever) for the pee. Three stainless steel (trust me) screws, about 1/2"
You're gonna be cutting a wedge out of the bucket bottom, and, yes, these were once the same color. Amazing, hunh? Here's a little better shot of the piece with the drain fitting in place. I left the little "wings" on either side in case I needed some extra plastic to screw it in place. I wound up not needing it and trimmed them off. 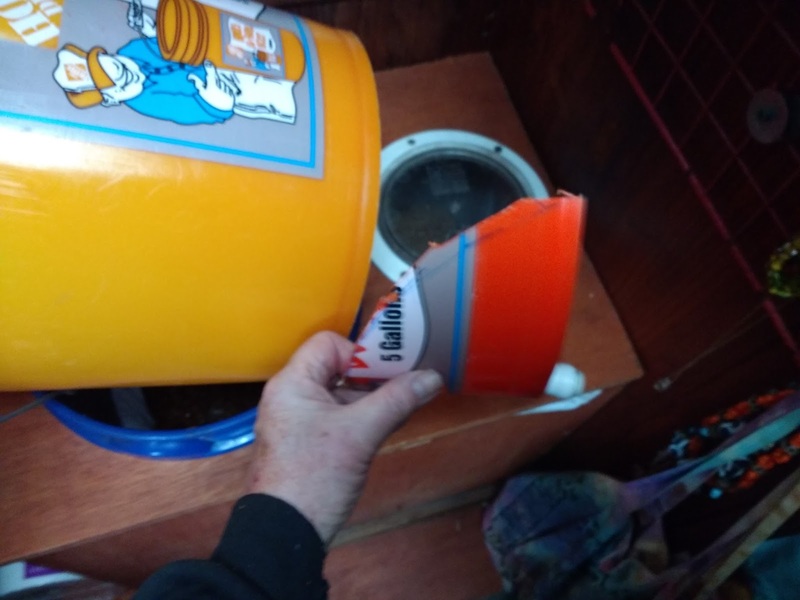 First, measure off a distance on your bucket from the bottom and up the side which is about equal to half the opening of your bucket composter. You're going to be cutting a wedge shaped piece out of the bottom and side, using about half of the bucket bottom. Cutting this polyethylene can be a bit of a challenge. The material is sticky, and can both flex AND shatter, an unfortunate combo. We used a jigsaw to do the cut, moving slowly and trying not to overstress the material. here's the wedge piece with the hose fitting in place. Drill a hole for your fitting in the bottom and screw it directly into the plastic. I recommend using plumbers caulk on the threading. We tried using a silicone caulk on the bottom around the fitting and it didn't stay. Hardly surprising. Virtually nothing will stick to polyethylene plastic, including paint, barnacles, glue, even permanent marker has issues. Snake the tubing trough the outside of the housing and through the side of the upper bucket half (that holds the seat). Drill a hole in the upper bucket piece for your hose to exit. Note that it needs to be up high enough that the lower composter bucket won't pinch it when you stack the two. it's okay if there's a bit of a downward bow to the tube before it exits the bucket(s). That will just provide a way for any leaking urine to drip into the composter bucket and not run down the tube. Run the tubing from outside your composter housing, through the upper bucket side, and force it onto the fitting for your diverter. Then put the diverter in place and screw it to the bucket. Pilot holes are recommended. Note that you'll be screwing the piece in canted, so it forms a sort of "V" with the drain fitting at the bottom. Use stainless screws if at all possible as urine is really corrosive. Here's the diverter screwed into place with the tubing press fit in place. Note that it doesn't interfere with snapping on the Luggable Loo toilet seat. It took a bit of tweaking to the system, moving the diverter down a bit so your bum didn't hit it and fiddling with the tubing so it didn't kink on it's way out of the bucket, but once we got those few bugs out, the system works spectacularly. We initially ran the tubing into a half-gallon milk jug just as a test and wound up emptying it on a daily basis. We've substituted a 2 1/2 gallon container for that one, which is much more convenient. 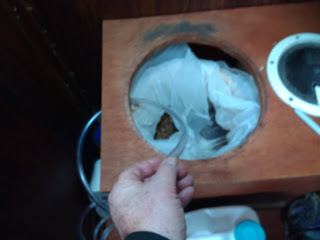 The big surprise has been just how seldom we've had to dump the solid waste part of the toilet (it's looking like 5-7 days at least), and how little biomass we're now using to keep it covered and odor free. We use a small squirt bottle of bleach water to keep the diverter and tube flushed after most uses so there's not even a whiff of urine odor. In general, I'm wishing we'd done this a lot sooner. It would've saved me a lot of hauling. Let me know if you try this. it's a simple fix. Thanks for your note, Barbara. We continue to tweak the system, but, in general, it is working just fine. The one recommendation I would make is use a line for the diverter larger than the 3/8" ID that we used as things like wood stove pellets can too easily clog it. I would go up to at least 1/2" ID if possible. Other than that, it has worked splendidly. 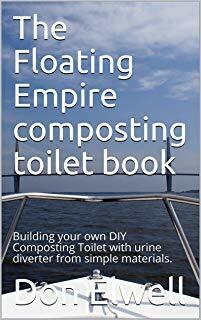 BTW Barbara, we just stuck all our composting toilet articles together into an Ebook (along with some additional material) and put it on Amazon. I've added the link to the original article above if you're interested. You had a good idea with this cut bucket method. The separett is ridiculously expensive for what it is. Yet separation is probably the best sanitation practice. Not only can it be cheap, as you show, but it is far more ressource efficient than the flush toilet and water treatment plant. I think it is the future of sanitation, and you are contributing to it. Thank you for sharing a little of your genius with us. Thsnks for the kind words. I can't really see any alternatives to this kind of system. We're running out of fresh water, and with the government apparently intent on letting the oil industry pollute all ground water, every drop could become crucial. Having lived with the system for over a year now, we love it. It's made dealing with the composting system a LOT simpler and less effort. I can't imagine going to any other system.